Step 1: What Is EFT? Originally developed for people, EFT is a modern energy healing technique that works on the energy system, not on the physical body. Unlike acupressure, you tap or touch very lightly, sending small energy pulses from your healing hands into your energy system, balancing and re-energizing it and clearing blockages as you do so. Another main difference between the EFT and acupuncture and acupressure is that you use your intention and focus to direct which particular problem you are working on. In energy work, energy flows where attention goes. Think about the animal and what specifically you would like to release, soothe or change. Find a phrase or a sentence that describes the problem succinctly and clearly to you, such as, "I'm afraid of spiders," - "I'm so stressed," - "I feel really sad." 0 = The Heart Centre. This is where we start and finish our round of EFT by placing both hands flat on the centre of the chest in the Heart Healing Position and take three deep breaths in and out. We say the Set Up statement out aloud and then we begin to tap. On each point, you can repeat the original set up or choose a shortened version, the Reminder Phrase, to keep you focused. Top Of The Head - The highest point on the top of your head. Third Eye Point - In the centre of your forehead. Start Of The Eyebrow - Where the bone behind your eyebrow turns into the bridge of your nose. Corner Of The Eye - On the bone in the corner of your eye. Under The Eye - On the bone just below your eye, in line with your pupil if you look straight ahead. Thumb - all finger points are on the side of the finger, in line with the nail bed. Karate Chop Point - on the side of your hand, roughly in line with your life line. 0 = And to finish the round of EFT, back to the Heart Healing Position where we take three deep breaths in and out. Take a moment now go through the sequence, starting with the Heart Healing position where you take three deep breaths in and out. Then find and touch each point in turn with your index finger. Touch each point lightly, breathe deeply and simply pay attention to how that feels, and how each point creates all kinds of different sensations you can feel in your body. The EFT treatment points are stimulated by tapping lightly on them. Even though we are using our physical hands on our physical body, we are not trying to massage muscles, bones or tissue but instead it is our energy hands tapping on our energy body which produce the results. Each individual tap is like closing an electric circuit. As such, tapping “harder” doesn't do the trick; but tapping with awareness and paying attention to the contact between your fingertip and your body as you tap really helps. You can tap with either hand on either side of the bilateral points. Normally people will tap with the index finger of their leading hand on the opposite side of the face. You can choose either side on the bilateral points. Try now tapping the point under your eye, with your index finger, quite gently and rhythmically, as many times as it takes for you to take a normal breath in and out. The strength of tapping should be light, just enough so that you feel a resonance from the tapping spreading out across a reasonable part of that side of your face when you pay close attention. Different people have different speeds of tapping, and the speed of tapping often relates naturally to what we are tapping on. We generally show a tapping speed in the rhythm of "Jingle Bells." For practice, turn back to the diagram. Start with the Heart Healing position and tap all the points from the Top Of The Head to the Karate Chop point, ending up with the Heart Healing position at the end, right now to get the feel of doing EFT. Remember to breathe deeply throughout and move towards finding a rhythm between the tapping and your breath so that the EFT round flows easily and smoothly all the way from the beginning to the end. A single EFT round is from Heart Healing to Heart Healing, with all the points from the Top of the Head to the Karate Chop point in between. When you tap EFT, let the feelings be your guide. You can feel in your own body when the energy flow starts to improve. In all modern energy work, it is extremely important to not just "tap the bad feelings away" but to keep tapping further rounds until you feel energized, happy, even joyful. Once you can feel the pain or the problem has gone, or you feel "nothing" any longer, think of positive energy forms you want and tap on those instead - love, courage, joy, strength, power, health or simply, "More energy!" all are good to energize you. Keep going until you really feel energy tingling in your own body and you KNOW you did a good job because you can FEEL that you did. 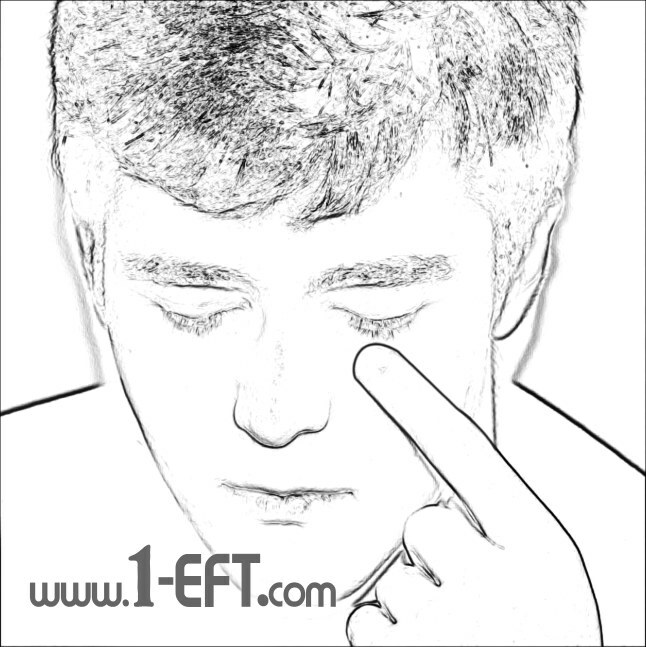 Step 3: Start Tapping EFT! ... and anything and everything you can perceive and focus your attention on.